The OtterBox Commuter offers more protection than any other back-only cover on the market. Like the OtterBox Defender we looked at in July, the Commuter’s protection is made up of multiple layers. The hard plastic shell will deflect sharp objects while the thick rubber layer will absorb the shock. There is even a clear screen protector (not applied in these photos) to keep the screen scratch-free. Unlike the more protective OtterBox Defender, the Commuter cover was simple to put on and easy to take off. 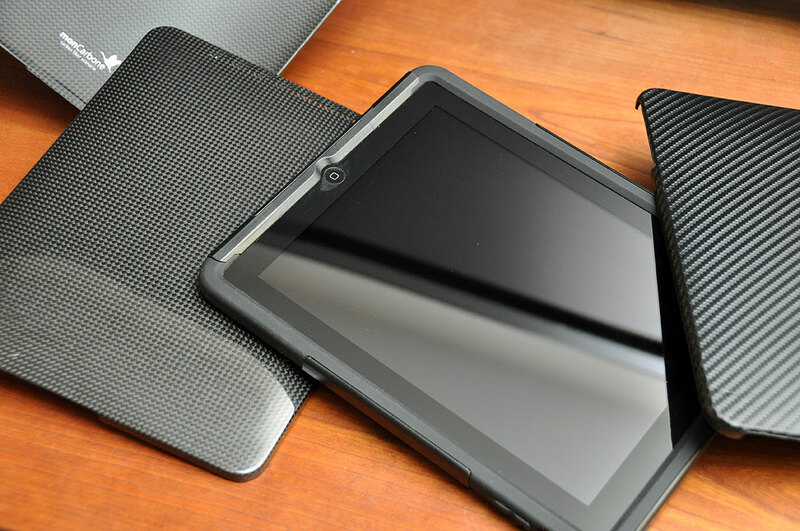 If you don’t like the idea of your iPad taking an occasional corner bump or blow, the Commuter is definitely the body armor you want on the iPad. The OtterBox Commutertakes the worry out of transporting the iPad everyday. It is bulkier than the other two on our list (monCarbone HoverCoat, XGear’s Shadow), but that is the price you pay if you want to be able to take a hit without flinching. The matte aluminum back of the iPad is nicely curved, looks great, and doesn’t show any fingerprints. However, we have noticed that it can be slippery and can slide out of our hands. Some folks like to add a thin cover to the iPad to make it easier to grip. Our solution would be to apply an InvisibleShield. This thin tough film will keep the iPad scratch-free and make it easier to hold. However, applying a film is not always an option. We found this out when we realized that the InvisibleShield made our iPad too thick to fit into the OtterBox Defender case. For those looking for the thinnest removable back cover, the monCarbone HoverCoat carbon fiber shell would be our first choice. Things made using carbon fiber (CF) cost more because it is not an easy material to work with. However, things made from it can be extremely thin and light because carbon fiber is amazingly strong and stiff. 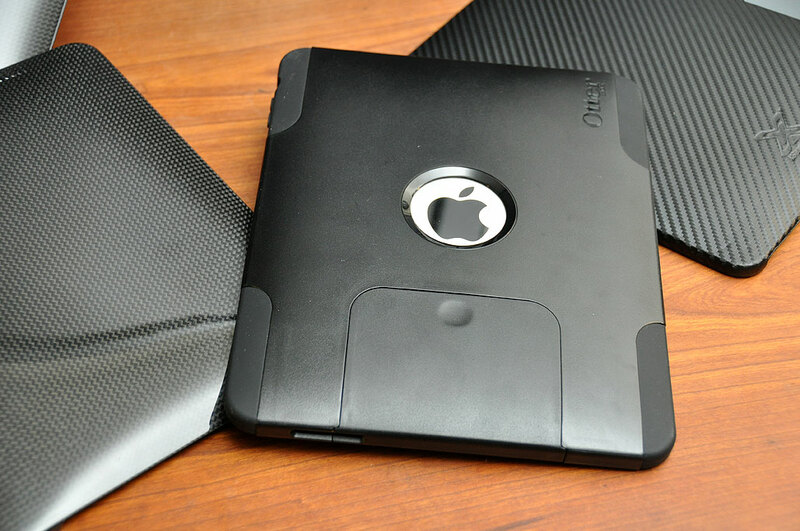 The monCarbone HoverCoat shell is made using just carbon fiber, is precision-molded, and fits the iPad like a second skin. The HoverCoat comes in two styles (gloss, matte). The glossy version shows off the weave of the fibers, but the matte finish hides the fingerprints. Both will add grip to the iPad, keep the back scratch-free, and give it a new distinctive look. Yes…the HoverCoat looks great, is super thin, and feather light. However, it does not offer any shock protection. For those looking for back cover with a little more cushion, but don’t need the level of protection offered by the OtterBox Commuter, the XGear Shadow would be a great option. The XGear Shadow is CF covered on the outside and lined with felt on the inside. This snap-on case can take a bit more abuse as the carbon fiber layer is bonded to a hard plastic shell. Because of the plastic shell, the XGear case is about 3x thicker than the monCarbone one. Unlike the monCarbone HoverCoat, the XGear Shadow does not come in glossy, so no fingerprint worries with this cover 🙂 We found the textured surface easy to grip and easy to keep clean. The felt-covering and extra thickness combine to offer more bump protection than just a CF layer. Like the monCarbone shell, all of the edgesof this cover are smooth and round. These three back covers are all great choices depending on your specific needs. If you want the lightest possible protection or a new high-tech look for your iPad, the monCarbone HoverCoat is a great choice. For those looking for a little more meat on a cover, the XGear Shadow shield the iPad without giving it bulk. For folks looking to hire a body guard for their iPad but don’t need Secret Service level protection, the OtterBox Commuter is the way to go. We’ll be taking a closer look at covers which protect the front as well as the back next. 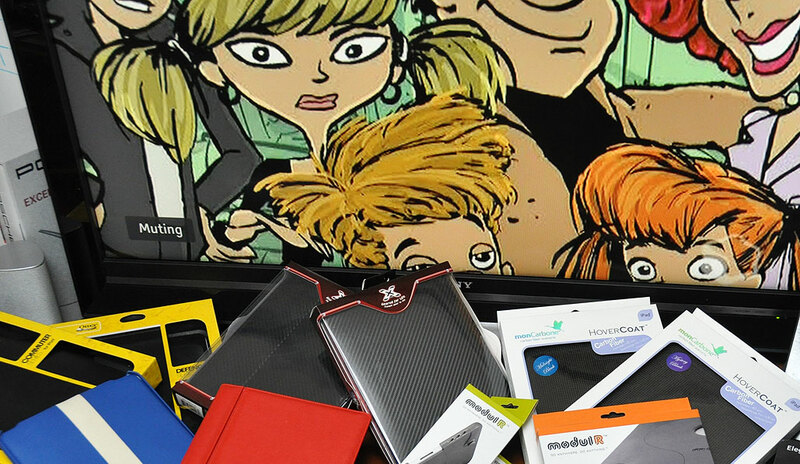 There are seven of them (Piel Frama Folio, XGear Folio, Sena Folio, M-Edge Method, OtterBox Defender, modulR, Vaja iVolution) on our Best Of Breed list. We will examine them in detail over the next two days. Whether you are looking for something for work, home, or play, one of them will be sure to meet your needs. Come check ’em out.